Swimming can be a most enjoyable and productive form of exercise - however, since one is supported by the buoyant effects of water, moving against and through that particular resistance (water) is made far more economical. The relative small shoulder girdle and upper arm action involvement accompanied by lesser involvement with the largest and strongest group(s)- the glutes and quadriceps, does not demonstrate the same dynamic force output that sprinting, squatting, and heavy “pulling” (deadlifts, power cleans, etc.) will. For a prolonged metabolic spike and overall fat “burn” don’t diminish the importance of properly intense weight training. 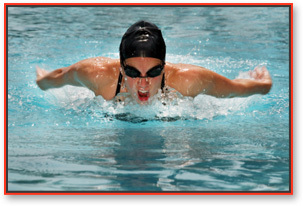 Most competitive swimmers (and all at the highest competitive level), spend many hours in the pool, and those who are most successful also have a favorable genetic predisposition (muscle fiber allotment and distribution) for that type of activity. You will probably not, for example, see a 4"11' 300 lb. Gold Medalist swimmer. So please be careful of stating that all swimmers are "thin as a rail" merely because they swim.....that is like saying that all jockeys are short merely because they ride race horses.